Find quick and easy chocolate recipes here and indulge in chocolate heaven,Chocoholics unite. I now wan't to bring you a recipe that I am very keen on but unfortunately I don't get to make very often as none of my family actually like coffee. In fact I can remember doing this recipe several times for dinner nights in the Officers mess and it went down a treat I can tell you,And this blog was my ideal chance to make this dish again all for me.While doing this dish I decided to find out a little bit more about coffee and in particular coffee houses and I was surprised at what I found out so I thought I would share a little bit of that with you taken from Wikipedia. Most widely known as coffee-houses or cafés, establishments serving prepared coffee or other hot beverages have existed for over five hundred years. Various legends involving the introduction of coffee to Constantinople at a "Kiva Han" in the late 15th century circulate in culinary tradition, but with no documentation. Coffeehouses in Mecca soon became a concern as places for political gatherings to the imams who banned them, and the drink, for Muslims between 1512 and 1524. In 1530 the first coffee house was opened in Damascus,. First coffee houses in Constantinople was opened in 1555 by traders arriving from Damascus and Aleppo. Soon after, coffee houses became part of the Ottoman Culture, spreading rapidly to all regions of the Ottoman Empire. In the 17th century, coffee appeared for the first time in Europe outside the Ottoman Empire, and coffeehouses were established and quickly became popular. The first coffeehouses in Western Europe appeared in Venice, a result of the traffic between La Serenissima and the Ottomans; the very first one is recorded in 1645. The first coffeehouse in England was set up in Oxford in 1650 by a Jewish man named Jacob in the building now known as "The Grand Cafe". A plaque on the wall still commemorates this and the Cafe is now a trendy cocktail bar. By 1675, there were more than 3,000 coffeehouses in England.There we go I thought that coffee house were relevantly more recent than over 500 years old I guess I was wrong. I wonder how many coffee houses there are now in the World,Europe and the U.K.? That brings me to the recipe and the fact this is my entry to this months great Chocolate challenge organised by Choclette @http://choclogblog.blogspot.co.uk/ And Chele@http://thechocolatepot.blogspot.co.uk/ and this months host Is Lucy@http://kitchen-maid.blogspot.co.nz/2012/06/we-should-cocoa-june-2012.html with this months special ingredient being coffee.Any one else wishing to participate follow the links to any of the links above it's great fun and well supported so why don't you join us.Finally to the recipe and I hope all you caffeine addicts and chocoholics enjoy. 1.Preheat the oven to 190oC/ 375oF/ Gas Mark 5. Grease and line a deep 20-cm/ 8-inch round cake tin. 2.Place the chocolate, butter and coffee in a heatproof bowl and set over a saucepan of gently simmering water until melted. Stir to blend, then remove from the heat and leave to cool slightly. 3.Place the whole eggs, egg yolks and sugar in a seperate bowl and whisk together until thick and pale. Sift the flour and cinnamon over the egg mixture. Add the almonds and the chocolate mixture and fold in carefully. 4.Spoon the mixture into the prepared tin. Bake in the preheated oven for 35 minutes, or until the tip of a knife inserted into the centre comes out clean. Leave to cool slightly before turning out on to a serving plate. 5.Meanwhile, make the syrup. Place the coffee, sugar and cinnamon stick in a heavy-based saucepan and heat gently, stirring, until the sugar has dissolved. 6.Increase the heat and boil for 5 minutes, or until reduced and thickened slightly. Keep warm. Pierce the surface of the cake with a cocktail stick, then drizzle over half the chocolate syrup. 7.Decorate with chocolate-covered coffee beans and serve, cut into wedges, with the remaining coffee syrup. Please treat this syrup as molten lava you really wouldn't want to come in contact with this syrup while cooking it or directly after cooking. Chocolate syrup was used for blood in the famous 45 second shower scene in Alfred Hitchcock’s movie, Psycho, which actually took 7 days to shoot. Wow, this looks amazing! This will for sure satisfy my craving for chocolate or any kind of sweets! What an exquisite photo - and a very informative post. 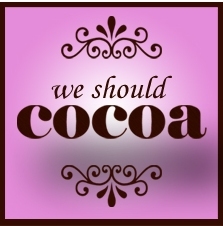 Thanks for joining in this month's #weshouldcocoa - it's proving to be a good 'un! Thanks for your comments ladies I'm glad you all like the dessert, and its a pleasure joining W.S.C. look forward to the challenge. A list of chocolate bars and country availability and makers. Follow Mac- Chocolate recipes's board Chocolate on Pinterest. http://www.macs-chocolaterecipes. Watermark theme. Powered by Blogger.